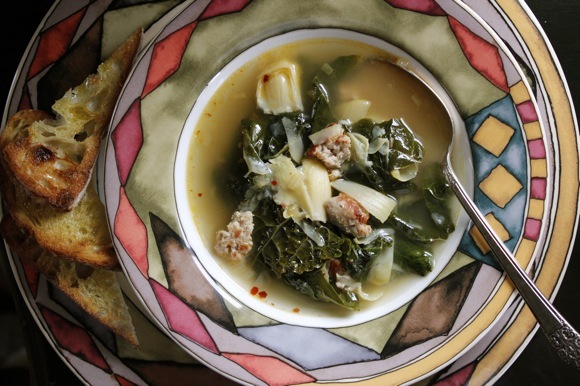 Back in January, a recipe for “Italian Chicken Sausage and Artichoke Soup with Chard” in Sunset magazine caught my interest. Over the past months I’ve added onion, garlic, fennel seed, and red chile flake to the original recipe. And sometimes substitute kale for chard. My procedure is quick and easy, and the synergistic result far exceeds the expectation of boxed chicken broth and canned artichoke hearts. In less than a half hour, this soup is on the table. I’ve served it as an everyday meal, as a starter to a rustic dinner topped with ricotta salata, and as an elegant first course. This year my Thanksgiving menu has a lighter aura, so this Tuscan Kale Soup will replace the heavier puréed soups of the past. Back in December we made Frank’s recipe for Pasta e Ceci from his wonderful blog inspired by the home cooking of his Italian grandmother called Memorie Di Angelina. I had all the ingredients on hand; canned chickpeas, olive oil, garlic, pasta, vegetable broth, canned diced tomato, fresh rosemary, red chile flakes. Then in February we were equally impressed with Linda’s recipe for Zuppa di Ceci from her absolutely delightful blog about food and travel, Ciao Chow Linda. 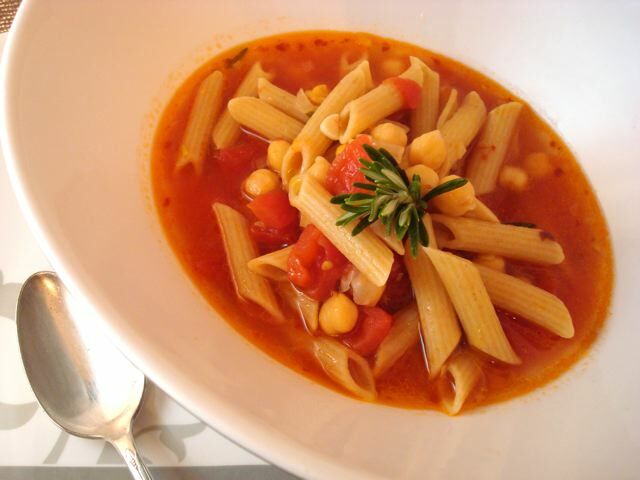 I’ve enjoyed experimenting with the recipe for Italian chickpea soups. It’s high fiber and heart healthy, made with ingredients from the pantry plus fresh rosemary and garlic. The combination of these simple flavors produces an amazingly complex-tasting result. In about 15 minutes!